Manchester United manager Jose Mourinho has today confirmed that Anthony Martial received a fine after failing to report for training in pre-season. Martial moved to Old Trafford from AS Monaco in 2015 and has since gone on to make 136 appearances in the famous red shirt. The Frenchman has also scored 36 goals during that time which is impressive considering that he has had to make do with featuring from the bench on many occasions. The 22-year-old burst onto the scene in England 3 years ago, scoring against Liverpool on his debut and finishing the 2015-16 season as the club’s top goalscorer, but since Jose Mourinho took the reigns as manager at the club his fortunes have taken a downturn. Last year he managed to make 46 appearances for United in all competitions and contributed 11 goals in the process, but from the start of 2018, he was left out of Mourinho’s starting XI most of the time after the arrival of Alexis Sanchez from Arsenal. There have been rumours of a tense relationship with the Portuguese boss, which according to Talk Sport, culminated in a fine for the France international this summer after he returned to training late following a leave of absence. “I am here for two years and a couple of months and the only player that was fined was Anthony Martial, so it is not easy to be fined here.” said the 55-year-old coach when asked at a press conference today about his relationship with another squad member, Paul Pogba, as per Talk Sport. 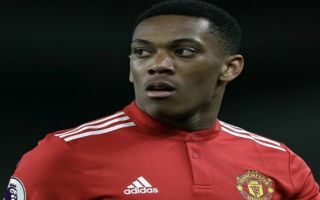 Martial was an unused substitute in the Red Devil’s 2-1 opening day win against Leicester City last Friday and it seems that he might have to wait for his chance to shine again after his minor misdemeanour in the summer. United take on Brighton this Sunday in their first away game of the new season and supporters will hope that if the Frenchman does play a part, he can again show the talent he has displayed only sporadically for the club up to this point.